But I know, like you know, many of us use the outdoors for personal reasons. In each of us lies the same unspoken understanding that nature is our therapy room - a safe haven for our thoughts and emotions. If you're lucky enough to go solo on the trail, you can cry openly or curse angrily at someone. Nature will never judge you, and at times, you even find a way to be less judgmental of yourself. I never doubt the power of the outdoors. Beyond its role as my therapeutic space, it has also been a place to reconnect with human spirit, whether within me or those who are dear to me. When our routines take a hold of most of our time, nature can be our escape or break from it. But sometimes it's also the embrace that we very much needed, the apology or the "I love you" that we yearn to hear. Or, in my case, I treated nature as the entry way to the beginning and ending of a certain chapter in my life. I wouldn't be honest with you if I didn't share this one fact - that a few months prior to the actual trek of Rae Lakes in early September of 2017, my mom passed away in May. Her passing came as a surprise. And yet, what disturbs me the most is not seeing her before she left and our unresolved issues remaining as they were for the rest of my life. When you lose a parent, time begins to tick but not in the usual way that it did before the loss. Time becomes your friend that you secretly resent. Time replaces money as your currency. Time becomes the most important factor in your life and of those you love. Indeed, it's the only thing we possess that can never be taken away unless we allow others to do so. The time I spent in Rae Lakes was about one thing - time. It was a time for me to walk alone again after being on a break from solo trekking - an experience that always seems to evolve through the passing of time. It was a time to redefine my outlook on hiking and the outdoors. A time to reflect on the pain I felt inside. A time to shamelessly cry. A time to ask myself questions about what happened. A time to wonder if I had regrets. A time to ask myself why I feel numb. A time to lose my old self and reluctantly say hi to the new one. A time to just appreciate stillness as I gaze beyond the Sierra Nevadas. A time to just feel nothing and everything all at once. A time to feel angry at myself and then a time to recognize my need to heal. A time to dissociate myself from the remnants of the past where my self worth was based on my mother's perceptions of me. A time to finally be me and be completely free, now that she's gone. A time to feel guilt and resentment. A time to acknowledge my mother's strengths & her faults. A time to question whether she loved me ...or more importantly, did I love her? A time to immerse in confusion of my own thoughts and emotions all tangled up hopelessly. A time to just exist...really. That was all I could afford until healing saves me. I entered Rae Lakes with the thought of dedicating the endeavor to my mother. I swiftly climbed up that Glen's pass thinking to myself that the closer I get to the sky, the louder my mother will hear me - my sobs, my questions, my words, my screams. I was afraid to hike back down to wake up from this illusion. I walked out on the fifth day. Because nature doesn't heal us. Only time will. 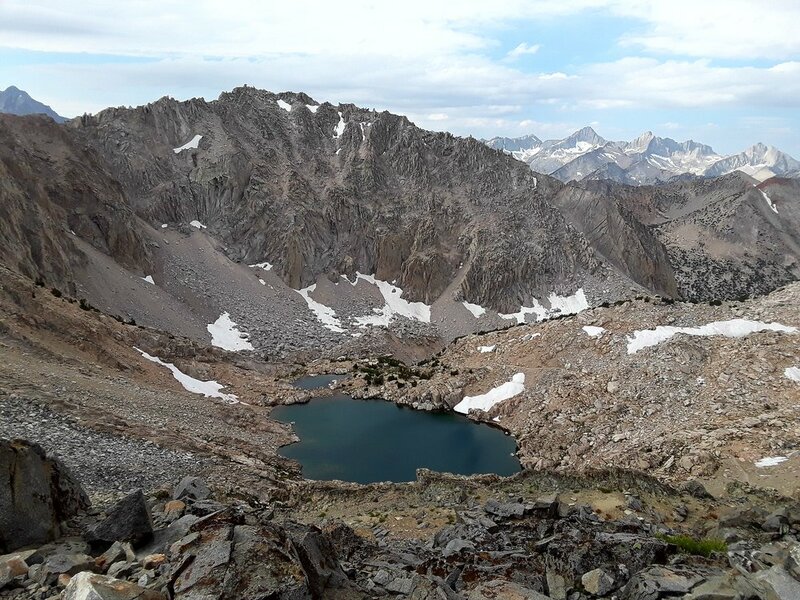 About Rae Lakes Loop: Rae Lakes loop is a 4-5 day trek in California's Sierra Nevada region. I followed the itinerary as outlined by Modern Hiker - see the article HERE. It's a very popular trail; hence, make sure to secure your permits months ahead. As a solo hiker, it is a safe trail to go on as it's popular enough so you can expect fellow trekkers with you on the trail. I did run into wildlife, i.e. a bear and rattle snake. Make sure you have your bear canisters for food storage as bear sighting is rather common.